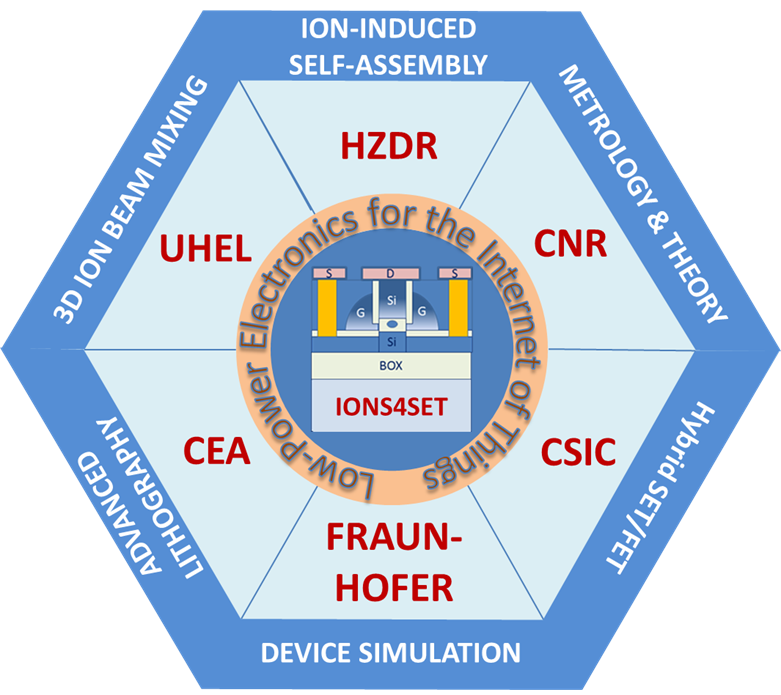 IONS4SET is organized in six workpackages which closely and actively interact to address scientific and technological issues and achieve project goals. The core workpackages regard the fabrication of the devices at different scales, from the nano-sized quantum dots to the whole layout. Such workpackages receive feedback from the workpackages dealing with theoretical modeling/simulations, and with the electrical characterization of the devices. The activities are presented to the Industry Endorsement Group to foster integration. Finally, WP1 workpackage is important for the guidance of the scientific research and for the dissemination of the project results as papers, participation to conferences and organization of workshops. In the following you can find the description of workpackage objectives, together with contact details. WP1 is primarily dedicated to project exploitation and dissemination activities to enable Innovation (here: low-power electronics) relevant to tackle societal challenges based on the project results. This includes intense external communication, in particular with industry, and specific measures of dissemination. A task at the beginning is related to specification / benchmarking of structures and devices to be developed in the project. Besides, WP1 also includes all the specific functions assigned to the project coordinator to ensure that the project successfully achieves its stated objectives on time, within budget and with the expected high level of quality. (ii) Evaluation of electrical performance of single-electron transistors based on silicon nanodots. 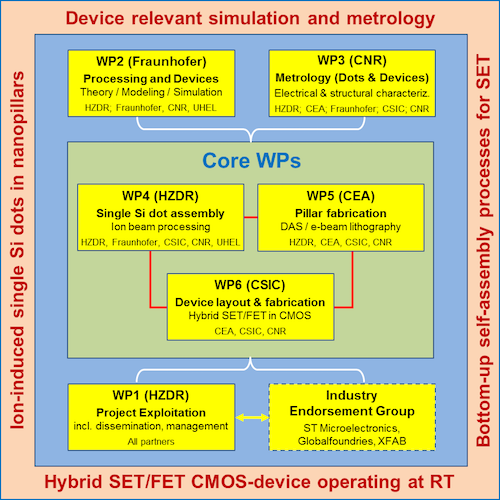 The main objectives of WP3 workpackage are the structural, morphological as well as electrical and functional characterization of the nanostructures and devices produced within WP4, WP5, and WP6. The data obtained by the structural and electrical characterization will be also compared with those obtained by the simulation and modelling activities (WP2). (ii) Broad-beam ion-irradiation induced Si nanodot assembly in pillars for hybrid SET-CMOS demonstrator-device fabrication. (ii) Directed self-assembly, whereas both approaches will be benchmarked. (ii) To demonstrate that these processes and methods are CMOS compatible by characterizing the proper operation of SET devices integrated in CMOS circuits.